Idea #1: Executives are critical for support and advocacy for social media training programs. In order to get their support, create a business case to help you sell your purpose, goals, and objectives for launching the program. Some executives are misinformed about social media and fail to see its business value. You will be challenged to drive employee adoption without their support, though, because who will motivate, rally, and encourage the teams to participate? Executives can be successful drivers for ensuring employees prioritize the training classes and adopt social as a business practice. Bryan Jones, VP of Dell, North America Marketing, has made Dell’s SMaC U certification training mandatory in their upcoming annual performance plans. How’s that for executive support? Idea #4: Balance between the “what” and the “how.” What you train on is important, but you must balance the how and go back to your objectives of the training. If you are trying to activate employees and change employee behaviors, you may need to consider in-person training with enthusiastic and engaging trainers to ensure the information is adopted. Dell hired an ex-comedian and corporate trainer to deliver their training content to ensure it was exciting and empowering for employee adoption. Think about not just what you are teaching, but how you are teaching it in order to best drive your desired outcome. Idea #9 (I absolutely love this one): Co-create with your best employees. You have employees that have already taken courageous steps to be more closely connected with your customers online. As they’ve been doing this for your business, they have some great real life insights to include in the training materials. Celebrate these rock star employees by including their tips and tricks in your content. Once the content is near completion, engage these employees to verify that the content rocks and is relevant to a broad employee base. 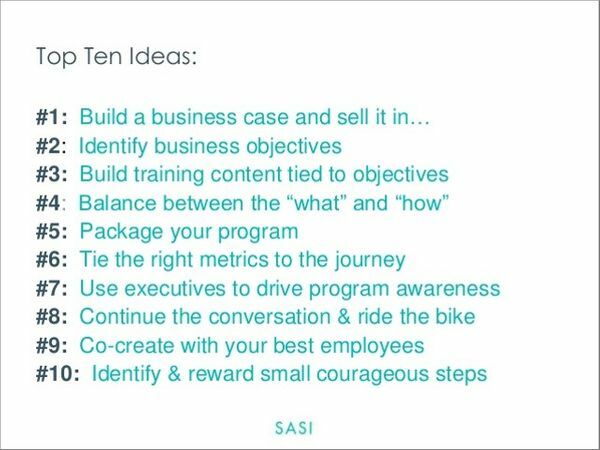 View the full top ten list of ideas for social media training here.